BOISE, Idaho -- When state and federal officials swooped into Salmon, Idaho, in 1992 to herald a new effort to help restore the Lemhi River's damaged salmon and steelhead habitat, Don Olson feared it was yet another bureaucratic takeover of his valley. Olson, who runs 500 head of cattle in this isolated central Idaho region, thought ranchers already were doing enough to restore fish runs that had plummeted from thousands of Chinook salmon in past decades to just 15 pairs and resulted in an Endangered Species Act listing. Though the goal was to put the valley's destiny into residents' hands instead of having measures to save fish forced on them, Olson bristled. "Why does another agency have to come in and set up another steering committee?" he told a newspaper reporter that November. Twenty years later the Upper Salmon Basin Watershed Program not only has survived, but it's been expanded to include the Salmon River's entire upper reaches in addition to the Lemhi and Pahsimeroi rivers. Its conciliatory aims remain unchanged: Improving areas for migratory fish to reproduce, while making sure ranchers can stay in business. And the once-skeptical Olson? He's become an ardent backer of the program, whose projects over the years were paid for largely with millions of dollars from Bonneville Power Administration funds intended to ease the impacts of Columbia River dams. The Bonneville Power Administration has spent at least $13 million on Lemhi projects since 2008, spokesman Michael Milstein said. With timber harvests about gone and mining hanging by a thread, Olson has come to regard helping salmon and steelhead as nearly as much of an economic necessity as he does keeping ranchers on the land. There hasn't been a recreational salmon fishing season on the Lemhi since 1978. "It's all linked together," said Olson, who donned a leather-banded cowboy hat on a recent trip to Boise to mark the group's 20th anniversary. "We need to get that back." In his youth, Olson once speared migrating Chinooks in shallow pools near his family's spread in the 1950s. Long before that, a Lewis and Clark expedition member, Sgt. Patrick Gass, noted in his Aug. 21, 1805, journal entry, "In this branch we shot a salmon about 6 pounds weight." By the late 1980s, however, years of haphazardly placed irrigation diversions and other obstacles on the Lemhi had blocked what fish that still arrived from reaching their ancient spawning beds upstream. Whole stretches were laid dry by diversions. The watershed group's first project in 1992 flushed water down the river in brief bursts, rather than diverting it into agricultural canals. 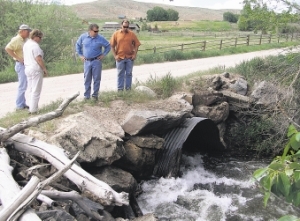 In the ensuing years, cooperating ranchers have reopened dozens of miles of streams, replaced culverts with bridges, helped develop acres of water-cooling, fish-shading streamside habitat and installed 250 fish screens on ditches to keep spawning salmon out of fields where they might otherwise become stranded and die. From 1992's 15 salmon pairs, 100 pairs are expected this year, said Tom Curet, the regional biologist for the Idaho Department of Fish and Game. Habitat hasn't just been improved for salmon and steelhead. Resident rainbows and the Lemhi Valley's bull trout, listed as an endangered species since 1998, also reap benefits. To be sure, all the headwaters habitat restoration in the world won't bring back salmon to the Lemhi in historical numbers, since their survival depends on a complex web of factors ranging from harvests on the Pacific, ocean conditions and Snake and Columbia river hydroelectric dams that kill a significant percentage of ocean-bound juvenile fish. But Jude Trapani, a Bureau of Land Management biologist, said the Upper Salmon Basin program is laying the groundwork for that day when other pieces of that puzzle come together. More fish are surviving the trip down river, thanks to Columbia and Snake river dam operators spilling more water. The dams' long-term future also hangs in the balance of an unresolved court challenge to the adequacy of the federal government's Pacific salmon restoration efforts. "What we're doing is setting the stage," Trapani said. "I've been here for 20 years, and I've seen the Lemhi and the Pahsimeroi turned around significantly. So the fish have a fighting chance." Idaho Rivers United, a Boise-based environmental group, is among the most-vocal proponents of breaching four Lower Snake River dams to save endangered Idaho fish. Even so, it's a big fan of the Upper Salmon Basin program, director Bill Sedivy said. "Everybody associated with the program should be applauded for all their hard work and compromise they've made to help fish," Sedivy said. Though 92 percent of land surrounding Salmon River tributaries is public, managed by the U.S. Forest Service or BLM, more than half the spawning grounds are on private land in the valleys, on places like Olson's 650-acre ranch. Consequently, public-private collaboration is essential if meaningful habitat-restoration is to be accomplished without disintegrating into bitter court battles. Not everything has been resolved. A long-term pact between Idaho, ranchers and federal salmon recovery officials at NOAA Fisheries over just how much water must be left in the Lemhi remains a sticking point, because ranchers contend the government's demands would put them out of business. But the important thing is that talks haven't disintegrated, said Kristin Troy, director of the Lemhi Valley Land Trust. "We have never gone to the dark place of becoming completely unneighborly," said Troy, whose group was started in 2005 by ranchers including Olson to help preserve agricultural land from real-estate development. "We've never lost that ability for fisheries biologists and ranchers to talk to each other."